Those of you daring to really fix up things with no compromise and wanting to get rid of problems before they come up may also wander the twisted path that I went down just recently. Sitting in "The Lab" one morning at a very early hour and being quite uninspired and bored I started digging in my boxes full of "unsorted stuff". During that a bag fell into my hand containing no less than 4 of these switchmode voltage regulator modules for the bigger IBM Netfinity machines (5600 or 6000R). They are designed for a single +12VDC input and programmable between 1.3 - 3.5VDC output voltage @ up to 16 Amps ... ready for the Pentium-III or Xeon. Remembering the problem I have with the overheating LT-1084CT 3.3V regulator on the P-90 platform I thought it were a good idea to test out to substitute the linear regulator with the SMVR and to "make it fit" in the 9595. 20 minutes later my 9595-B06 RAID-box ran with a P90 platform plus a P-133 CPU (I had no faster spare at that point) and with the switchmode regulator module from the Netfinity. The module gets merely hand-warm. The bigger one of the two coils heats up a little - but that was it. No comparison to the "space heater" LT-1084 with its flimsy heatsink. | o  o  01         . N.C.                     N.C.
| o  o             . N.C.                     N.C.
As you can see on the tables above: the pinout is pretty simple. The pins "#" in the upper table are those which are of importance here. The lower table shows the codings for the output voltage. The 3.3V setting is separated from the rest of the table, which is only the half of it anyway. If V(id)4 is tied to GND too the V(out) will be between 1.3V and 2.05VDC. Since this is of no relevance for our purposes I gracefully left it away. It is recommended to operate carefully. Mindless ripping and careless acting with tools will cause damage on the platform. Start with unsoldering the holder pin for the heatsink first. It may need a bit more heat and a little pulling force to come free. The heatsink fixing pin isn't electrically connected to anything on the board - so it is not that dramatically when the copper soldering pad / through-hole copper comes off. Nontheless: try to avoid that. Then unsolder the 3 terminals from the LT-1084. You might try unsoldering all 3 at one time and pull out the chip by gently pulling and wiggling it a bit sideways. Then clear the area around the 3 solder holes and at least the middle hole entirely from tin. Check for left-over tin and potential short-circuits - and that was it for this part. On my regulator the most of the upper copper surface is GND, the most of the lower is either +12V input or V(out). I decided not to bother with any sort of "plug" or whatever row of contacts. Just straightforward solder the wires as tight and direct as possible. So I scratched a 2 by 6 mm spot clear from paint on the GND plane and on the +12V input plane and soldered two thick wires directly to the board. 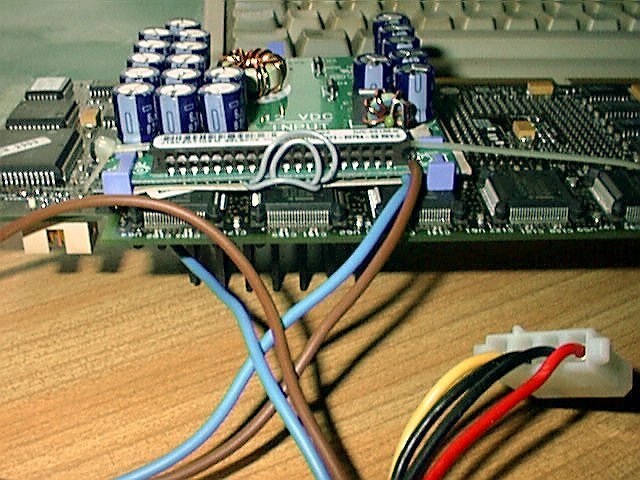 The opposite end of these wires carry a standard DC plug to fit in the 9595 power supply. 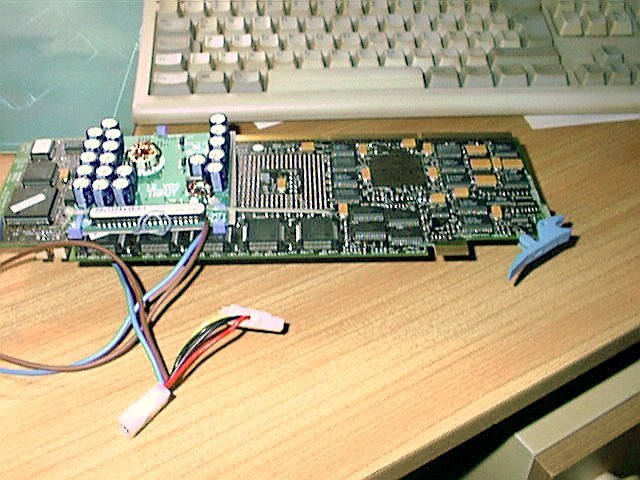 Later I used a male-female combo (as for these silly processor fans) not to loose a DC plug on the power supply. 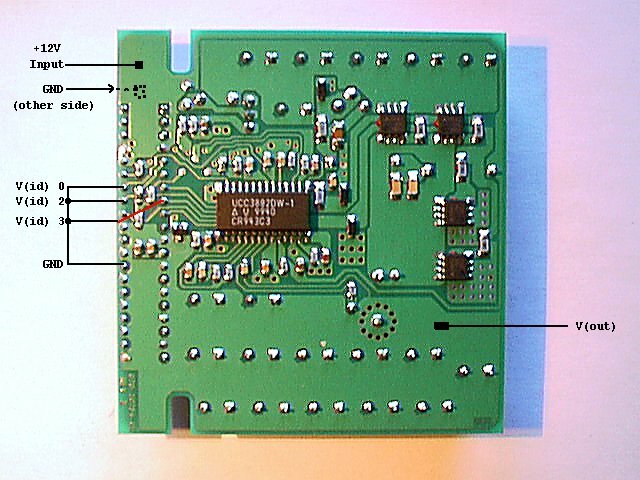 Some thin "patch wires" connect the pins V(id)0, V(id)2 and V(id3) with the nearest GND pin. Pick any - there are many. Bench-testing with a bare 95 power supply gives a straight 3.34VDC output on the V(out) plane / pins. The voltage did not drop significantly when being loaded with 6 Amps (a couple of parallel 25W resistors / 4.7 Ohm). Heat-emmission: almost none. The converter coil L2 gets a bit warm. Now: there are no provisions for fixing the regulator elsewhere. 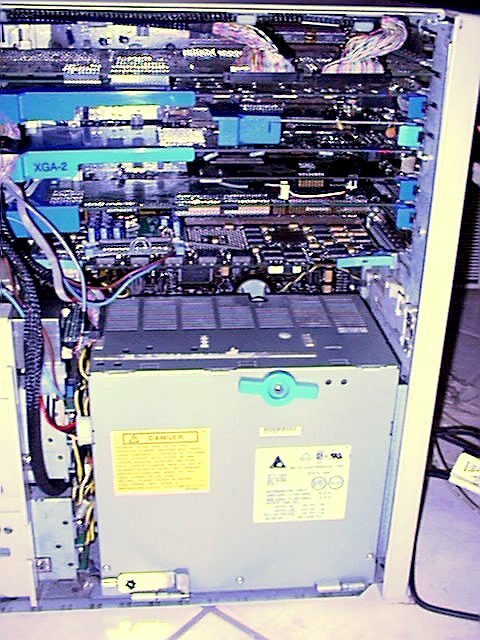 The simpliest method was just to strap it onto the upper side of the processor platform. 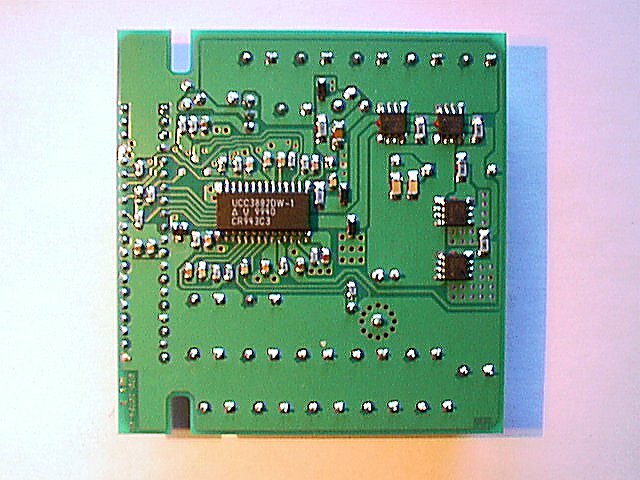 It is relatively flat, there is room (given you don't have a long MCA board installed in the bottom-most slot #8) and the way down to the power supply as well as to the solder pads of the removed LT-1084 is pretty short. The output voltage is fed with a short, thick piece of isolated silver wire (dia. about 1mm) from the regulator down to the mid-pin of the -removed- LT-chip. In addition I cut a piece of thin cardboard to act as an insulator sheet between the regulator and the processorboard. Any mistake in the combination of parts like e.g. using an 82496 +5V-only cache controller instead of the 82497 or a falsely orientated / mis-aligned CPU will cause massive damage ! The little LT-1084 regulator shuts down at latest 5 Amps .... but a baby like that can pump up 16 Amps (or more !) 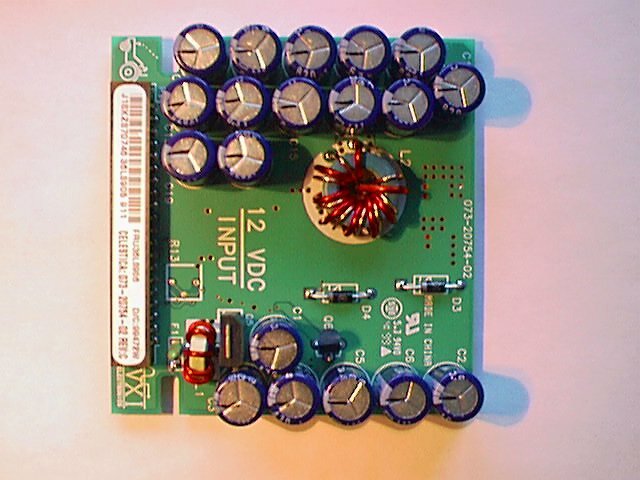 into your circuit - fed by a power supply that delivers 35 - 45 Amps at 12VDC. That will blow a CPU out of the socket if it isn't in proper orientation. And will - most likely - cause massive damage to the platform printboard itself.